Clever Jack Riewoldt tap to Jake King who runs in and kicks the Tigers' second. Tigers InterchangeIvan Maric off due to an injury. The Tigers have done well after a slow start as they start to exert their influence onto the game. McGuane looks up at goal and his eyes light up as he has a shot, but the light may have blinded him as the kick falls short and the Cats clear it away. BEHIND CATSChristensen comes out and takes the mark, has a shot on goal and manages to push it across the face. GOAL TIGERSKing is taken high 40m from goal and is awarded a free kick. Push-up kicks his second goal of the game and gives the Tigers the lead. GOAL TIGERSRiewoldt comes out and takes the mark 35m out directly in front. He kicks an easy looking goal and says, injury, what injury?. GOAL TIGERSRiewoldt taps it into the path of King, who swoops onto the ball and kicks a great running goal. The Tigers are back! BEHIND CATSMotlop comes out and takes the mark 45m from goal on a slight angle, he kicks it away for a point. Jack Riewoldt seems to be moving a lot more freely now, after his earlier injury scare. The Cats are getting on top of the Tigers early in this contest, the Tigers must play a more attacking brand of football. GOAL CATSChristensen handballs over the top to Bartel who kicks his second goal at the edge of the goal square. GOAL TIGERSEllis comes out on the lead and takes the mark 40m from goal directly in front. He slots it through for a goal. Riewoldt is back on the ground, being given the all clear from a corked thigh. GOAL CATSStokes gathers the ball, looks to give it off but in the end he decides to go it alone and he kicks a goal. Tigers InterchangeJack Riewoldt off due to an injury. A terrifying sight for any Richmond supporter with Riewoldt limping off and going straight down the race. GOAL CATSBartel marks the ball from 25m out directly in front, he slots it through with precision. The Cats kick the first goal of the game. BEHIND CATSThe ball is rushed through for a point for team Cats. A fast opening from both teams, now with the Tigers recent bad history against the Cats, they would want to get themselves a good start. We are under way as the umpire bounces the ball perfectly into the turf. Welcome to the MCG on a cold Melbourne night, but we have a treat for you! A match between the Tigers and the Cats! There are no late changes and the subs are White and HorlinSmith respectively. Welcome to MCG for the Richmond v Geelong Cats Round 6 clash. GEELONG maintained its unbeaten run overcoming a persistent Richmond with a 44-point victory at the MCG on Saturday night. The Cats kicked 20.11 (131) to Richmond's 13.9 (87). After slipping 19 points behind the Tigers midway through the second quarter, the Cats woke from their slumber. 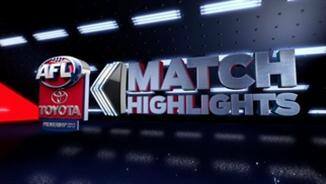 They began to win the ball out of the centre (after being thrashed in that area early) and kicked four consecutive goals to regain the lead just before half-time. From that point on, the Cats dominated. 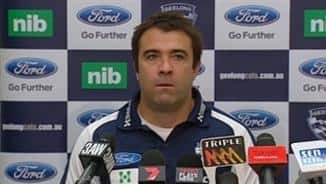 Geelong coach Chris Scott admitted he was in a good mood after the game but was not exactly celebrating at half-time. "We had some specific things that we needed to get right," Scott said of his approach at half-time. "We were actually a little bit disappointed that we weren’t following through on some of the things we talked about during the week. But that improved a lot during the second half." A pulsating start to the third quarter was critical to the result. 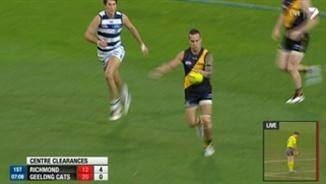 In that time Geelong kicked three goals while Richmond lost its two big men, Ivan Maric and Tyrone Vickery, to injury. Vickery was subbed off after a head clash with 200-gamer Steve Johnson, while a brave Maric returned but was running with a limp for the rest of the game. 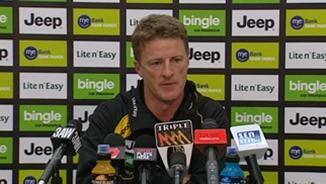 Richmond coach Damien Hardwick said that the injuries affected the team strategies, and from that moment on he was trying to plug holes in all parts of the ground.. The Cats' small forwards were the difference during that period. Allen Christensen was brilliant in attack and through the midfield, Mathew Stokes' creativity shone and Mitch Duncan showed his class. Up until that point Richmond had showed it could compete with the Cats. It dominated the centre clearances, leading that statistic 12-4 at half-time, but couldn't control the game. 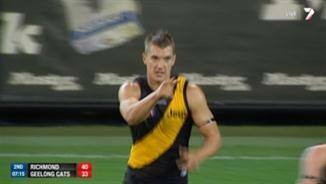 Too often the Tigers coughed up the ball with a skill error, Troy Chaplin's speculative handball into the middle of the forward 50 late in the second quarter that led to a Christensen goal the most blatant example of their occasionally errant disposal. "They are the sort of mistakes that the good sides make you make, but we have to eradicate," Hardwick said. Even with the ball going inside Richmond's forward 50 the Cats were able to bring it to ground where champion Corey Enright (in his 250th game), Andrew Mackie and their heir apparent Cameron Guthrie just swept it away. That was just part of what was upsetting Tiger fans however; not seeing Richmond receive a free kick in the second quarter did little for their mood. At times it felt it would have been easier to win a grin from the Mona Lisa than a free kick if you were a Tiger fan. Geelong's band of ball thieves at ground level were too good and the Cats overpowered the opposition. "They are a good side," Hardwick said. "They are obviously six and zero for a reason. They are outstanding." Riewoldt battled hard after suffering a corked thigh early in the game yet never threatened. A couple of cameos from Jake King – one goal coming courtesy of a Jack Riewoldt tap – were the other highlights in another disappointing night for Richmond. Ricky Petterd was reasonable for the Tigers and Shane Edwards and Daniel Jackson did their jobs. 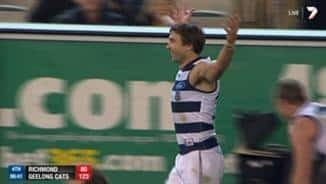 However when Enright kicked a set shot from the boundary (the 10th goal he has kicked at the MCG in his career) and every teammate ran to congratulate him it capped off a brilliant night for the Cats. Richmond now takes on Port Adelaide at AAMI Stadium while Geelong prepare for the match of the round against undefeated Essendon on Friday night. Geelong: Christensen 3, Bartel 2, Johnson 2 Smedts 2, Hawkins 2, Duncan 2, Stokes 2, Murdoch, West, Selwood, Enright, Blicavs. Richmond: King 4, Riewoldt 3, Martin 2, Knights, McGuane, Ellis, Grigg. Geelong: Christensen, Johnson, Duncan, Stokes, Selwood, Enright. Richmond: Edwards, Jackson, Newman, Cotchin, Petterd. Geelong: George Horlin-Smith replaced Jordan Murdoch in the third quarter. Richmond: Matt White replaced Tyrone Vickery in the third quarter. Umpires: Chris Donlon, Mathew Nicholls, Chris Kamolins. Official crowd: 55,625 at the MCG.